You’re Invited: Annual International Women’s Day Historic Field Trip! Students, faculty, staff, and the University of Rochester community are invited to us for our third annual International Women’s Day Historic Field Trip on Friday, March 8. 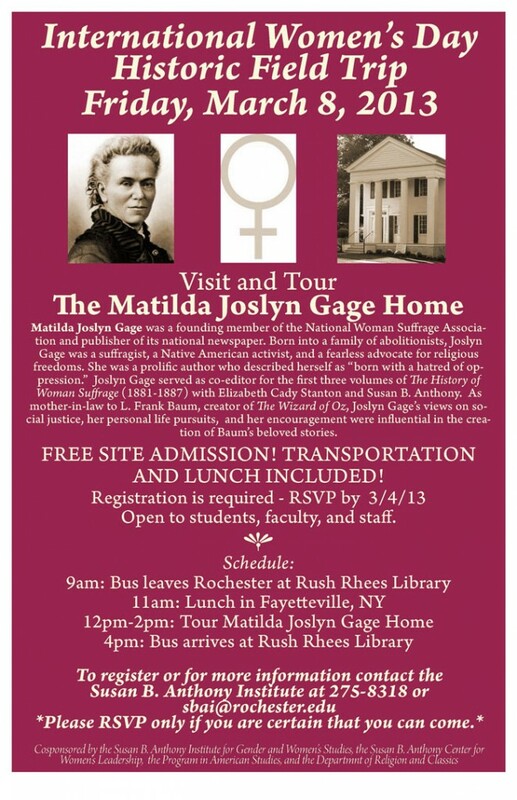 This year we will be visiting the Matilda Joslyn Gage Home in Fayetteville, NY. This trip is FREE of cost for all participants and includes site admission, transportation, and a vegetarian-friendly lunch. Registration is required. We kindly request that you only RSVP if you are certain you can attend. This ensures that we can continue to offer this trip free of charge. RSVP to sbai@rochester.edu by Monday, March 4. This entry was posted in SBAI Events and tagged #historictrip, #humanrights, #internationalwomensday, #iwd, #iwdtrip, #matildajoslyngage, #nativeamerican, #religiousfreedom, #socialjustice, #suffrage, #wizardofoz, antioppression, women'shistory. Bookmark the permalink.